The concept of the mid-life crisis is common. You grow up, work for a bit, get married, and have kids. A decade or two down the road you feel lost, unsatisfied or unexcited with where your life is going. The concept of a quarter-life crisis is similar. Only you are often younger and may not have much stability in life just yet. Most people in their 20s might joke about the idea of having a quarter-life crisis until it actually happens to them. If you’re feeling uninspired and unfulfilled with most aspects of your life, whether it’s your job, your finances or your relationships, you may be experiencing a quarter-life crisis. The worst part is having no idea what your next step will be. 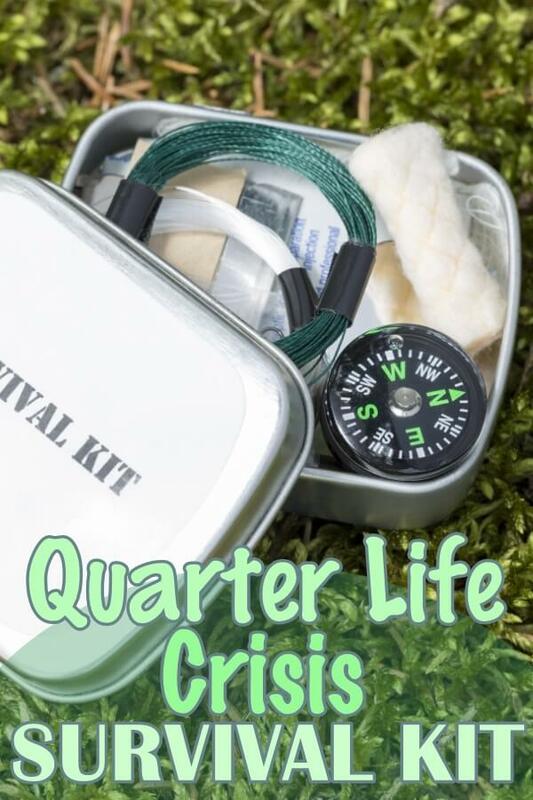 If you’re eager to re-evaluate your life, this quarter life crisis survival kit will equip you with the mindset and skills needed to get things rockin' again. Practically everyone goes through a stage in life where they have to stop and ask themselves what path they really want to take and what will make them happy. If you’ve just reached a major goal like graduating college or landing a new job, things may not actually be what you expected. Or you may just be looking for your next move (literally or figuratively). Stop trying to fit a square puzzle piece in a circle’s spot. Instead of jumping into the next phase of your life and taking a path that may be unclear, it’s important to stop, revisit your passion and and evaluate how far you’ve come already. Don’t try to solve every problem and doubt in your life all before sunset. When you slow down and stop focusing so hard on your life path, ideas, people and experiences will come your way daily and offer inspiration and guidance. For example, you may meet your next business partner in a coffee shop or your friend might tell you about a killer job opening. These instances happen in during day-to-day occurrences and often can’t be planned for ahead of time. Your finances can play a large role in your quarter life crisis. Maybe you feel like you don’t have enough money. Maybe you feel like you waste too much money on unnecessary things. Whatever the case may be, it’s extremely hard to feel like your life is on the right track when your finances are on shaky ground. Add up all of your monthly income, total up your debt, and start tracking your spending. You can sign up for a free account with Mint.com to connect all your bank, credit, investment, and debt accounts in one place and start setting financial goals. After you’ve tracked your spending for at least 30 days, recreate a specific budget that is going to allow you to pay off high-interest debt, put money into a savings account, and spend consciously on the things that matter to you and not on impulse purchases. If you’re feeling lost in your current career or in need of some guidance, you should talk to a coach or mentor who can help you redefine your purpose and skillset so you can secure a fulfilling job. Being able to speak to someone about your thoughts, failures, successes and aspirations will help motivate you and restore the drive and determination needed to land a job that makes you happy. If you are not having career issues, you can always reach out to a life coach to talk to you about more specific and personal topics in order to help get your life back on track. Comparing yourself to others is the worst thing you can do during a quarter-life crisis. Everyone is on their own life path and dealing with their own personal insecurities. These reasons make it unrealistic to compare where you are in life with anyone else. Take some time away from social media if you can and focus on yourself. Grab a planner, and start organizing your day and setting small goals that can be achieved. Think about things that need to get done around your house and in your life. Stop procrastinating and start checking those tasks off each day. If you feel like you never have enough time in the day to accomplish things, getting organized and planning out your day will save time. You may not know exactly what you want to do. But imagine what your dream or ideal week would be like. Determine where you will live, what type of work you will be doing, and what you will do for fun or entertainment. Then, you can start establishing smaller goals based on those ideas to help you reach them. A lot can change over the next few years so it’s best to create a rough plan and be open to change!